a truly effective Buddy signaling device! 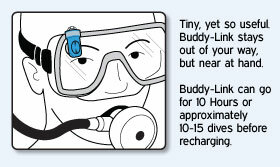 Buddy-link attaches unobtrusively to the outside of your facemask. Tap a button—a pattern of 4-color LED lights will flash in your buddy’s peripheral vision, and a matching tune will sound. You'll know the message was received when your unit flashes an acknowledging light. Interesting fish caught your eye? Share it with your buddy instantly. Need to change course? Notify your buddy without contortion. Want to explore a cave or wreck? Go for it. 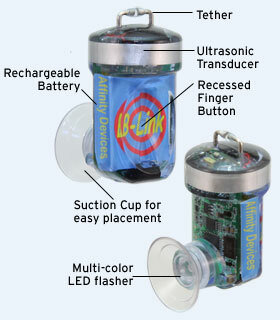 B-Link works in open water or confined spaces. (via color) the distance to your buddy, or when one of you is getting out of range. Use in pairs, or groups. Buddy-Link mates to any other B-Link unit, and can be mated in pairs or groups. 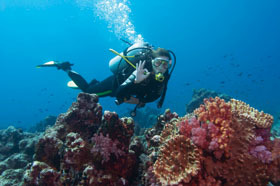 500 private channels allow multiple diver pairs/groups to operate in the same area without interference. Small as a thumb, quick and easy, friendly to fish and other divers, with a powerful range. Simply the most effective way to signal underwater. ©2008 Affinity Devices, Inc. All rights reserved. banger. It was quite rewarding to ping it and see my buddy look up from what he was doing 15m away..."